BenQ has announced that its first 4K DLP projector, the HT8050, will be available through select dealers on February 24 for $7,999. Using Texas Instruments' new 4K chip with XPR technology to purportedly reproduce a full 3,840-by-2,160 resolution, the THX-certified HT8050 also uses a 4K optical system with 14 high-resolution elements and special low-dispersion lens coatings. It will feature 1.5x zoom, as well as horizontal and vertical lens shifting. The HT8050's brightness is listed at 2,200 lumens, with a dynamic contrast ratio of 50,0000:1. There is no mention in the press release below or on BenQ's website of support for HDR or a wide color gamut--two features of the Ultra HD Blu-ray spec--so we can only assume that the HT8050 will not support these technologies. 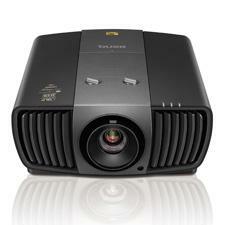 BenQ America Corp. has announced the North American debut of the HT8050 home cinema projector. Delivering breathtaking cinematic performance along with BenQ's Colorific performance, the HT8050 is the world's first DLP 4K UHD projector to achieve the prestigious THX HD Display certification, delivering outstanding performance that rivals commercial digital cinemas. "Consumers today want a home cinema experience that reproduces the big screen entertainment they get at the movie theater," said Russell Barefield, director of sales at BenQ America Corp. "Now, with the BenQ HT8050, integrators can install a projector that will satisfy even the most discerning videophile. No other DLP display uses the same technology that 100 percent of the world's IMAX auditoriums use, with 8.3 million pixel UHD performance and THX certification. Viewers are guaranteed an unforgettable experience right at home." Meeting Consumer Technology Association's (CTA) requirements for 4K UHD, the HT8050 harnesses the advanced DLP 4K UHD chip with XPR technology to reproduce 3840 x 2160 distinct pixels for true 8.3 million pixel 4K UHD resolution. Single-chip DLP technology ensures absolute image integrity and color accuracy without artifacts that can be introduced by panel alignment issues, which is especially critical for 4K content given it has much finer pixels compared with 1080p. BenQ's optimized 4K optical system employs 14 high-resolution elements, a true zoom system and special low-dispersion lens coatings to preserve spectacular visual quality for an authentic digital cinema experience. Reserved only for best-in-class audio and video systems, THX certification guarantees that the HT8050 accurately reproduces content the way the director originally intended. Requiring 10 times as much data analysis and seven times the engineering effort and resources in precise color and gamma adjustments as required for pure Rec. 709 compliance, the HT8050 underwent over 18 months of rigorous development and 200 THX laboratory tests covering over 500 data points to ensure strict color accuracy, precise gamma, ideal color temperature, enhanced uniformity and super high native contrast ratio for THX certification. Passing three rounds of live testing at THX's headquarters in San Francisco, the HT8050 offers supreme overall image performance with a pre-calibrated THX Mode engineered by THX to offer the most accurate out-of-box picture quality possible. Augmenting its high native ANSI contrast ratio, the HT8050's Active Iris and Dynamic Black technology, SmartEco and proprietary black paint sealed light engine produce an astounding 50,000:1 dynamic contrast performance for fine detail rendition in the darkest and brightest scenes without any washout to preserve every subtlety of the original content. The HT8050's CinemaMaster image processing technology improves vivid color reproduction, flesh tone correction and advanced digital color and luminance noise reduction. In addition, the HT8050 is ISFccc certified, enabling professional in-home custom calibration. The HT8050 natively supports a 2.35:1 anamorphic aspect ratio, offering the ultra-wide cinemascope experience of commercial digital cinemas. Its UHD performance opens a wider viewing angle to allow comfortable viewing of ultra-detailed 4K images up close, maximizing screen size in any given space for the most immersive movie watching experience. With a streamlined style featuring sleek front-facing ventilation, the HT8050 blends seamlessly into any home cinema setting. Its unobstructed port architecture features extra space to accommodate high-quality cables with HDMI/power cable locking to hold them securely in place. Other HT8050 features include H/V lens shift and 1.5x big zoom for custom installations. Powered by DLP technology (2015 Academy Award of Merit Oscar-winning technology) used in 90 percent of the world's digital cinemas, the HT8050 delivers Colorific performance--accurate, crisp and long-lasting picture quality with no color degradation over time. The flagship HT8050 home cinema projector will be available Friday, February 24 at an MSRP of $7,999 through a select reseller network including AVAD, AVI-SPL and another exclusive reseller coming soon. • Visit the BenQ website for more product information. • BenQ Announces HT1070 Projector at HomeTheaterReview.com.